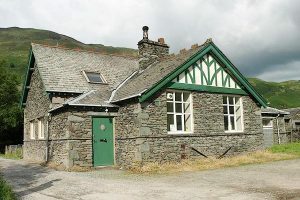 The George Starkey Hut used to be the Patterdale Parish Rooms, and prior to this was the village school and school canteen. The building is directly adjacent to the ‘Old School House’, now a B&B, which was the home of the former headmaster. 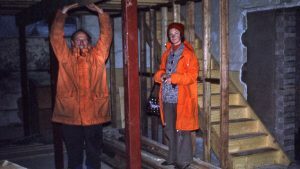 The ABMSAC search for a club hut began in 1971 and resulted in the signing of a 28 year lease in October 1974. 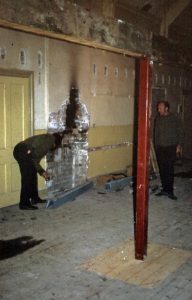 The building was and is leased from the Carlisle Diocesan Board of Finance Ltd by ABMSAC Limited No. 1176891 (renamed the George Starkey Hut Limited in 2016). The Ltd Company was set up to run the Hut and is limited by guarantee with each ‘member’ of the company being liable for a sum not exceeding £10 in the event of the Company going bankrupt. 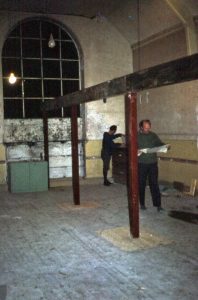 Before the building could be used, extensive modifications were carried out to install a mezzanine floor and bring the facilities up to a standard where it could be used by members of the ABMSAC / TCC and let out to other like-minded clubs. Quote from the ABMSAC Centenary History 2008 by James Bogle. installation of staircase to the dormitory floor. The ABMSAC contributed £6,913 and in addition £7,249 was grant aided from the English Sports Council, and £2,500 from the central committee of the Swiss Alpine Club (SAC). However this was considered still not quite adequate. The Tuesday Climbing Club, London based, contributed a further £2,600, both clubs agreed to contribute towards the running costs and management of the hut on a basis of two thirds ABMSAC and one third Tuesday Climbing Club. Company directors were appointed in the same ratio, four ABMSAC and two for TCC. A major upgrade to the Hut was done in 2004 Including an upgrade of all electrical systems, a fire alarm system, kitchen refurbishment, the removal of the back boiler and modifications to the water heating systems. A number of shorter leases were negotiated from the end of the initial 28 year lease and a new thirty years lease was signed in 2014. An annual maintenance meet is organised by club members but the more technical maintenance work is “contracted out”. The first of the annual maintenance meets involving both ABMSAC and the AC re-commenced in September 2017. The membership and activities of the TCC declined and they decided to disband. 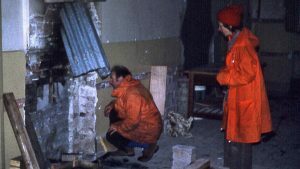 The residual funds remaining were gifted to the George Starkey Hut Ltd with a request that certain refurbishment work be preferred. During 2015 much discussion was had at ABMSAC committee level, and by the directors of ABMSAC Ltd, as to how to continue the management of the hut. By this time there was a backlog of work to be done on the hut and approximately £25,000 was spent on 2 new windows, renewal of all 30 bunks, mattresses and pillows, a new front door with keysafe system, and renewal of the skylight windows to the dormitories. Finally a smokeless fuel stove in the central lounge. see picture gallery. This was named phase 1 and project managed by Mike and Marian Parsons as Chairman of the Board and ABMSAC Club President, and Hut Warden/ booking secretary respectively. Ongoing, finance was not deemed a key issue as there had been a steady small surplus of income over expenditure over the years and a healthy balance had built up. The key issue was management resources, particularly since the ABMSAC membership was declining and ageing rapidly and the TCC was disbanding. In May 2016 an agreement was signed with the Alpine Club based on a 50/50 partnership. That means finance, directors, management committee members, and company members, were shared equally. The ‘chair’ was to alternate between the two clubs and is currently for a three-year period. The AGM will take place alternately at the AC and ABMSAC AGMs, the first having taken place at the AC AGM in November 2016. All the remaining windows on the south and east sides, 6 in all. These had been single glazed, (with some retro plastic double glazing which had failed) rotten or in the case of the south end metal window, badly corroded and leaking, water ingress having damaged the south end wall. This was recognised by TCC members and they had recommended this as a priority for use of their donation. link to George Starkey Hut pictures after phase 1 in 2016.